Although her two-year fight with cancer ended when Suzanne was just 35 years old, her strength, courage, and grace will be forever remembered. 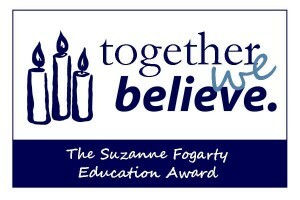 Inspired by Suzanne’s love of teaching and service, her family asks that her amazing spirit live on with the Suzanne Fogarty Education Award. The Award was created for deserving students at Saint Peter the Apostle Catholic School and Blessed Sacrament Catholic School.